All of our Bhutan itineraries are tailor-made for each individual client, according to their requirements and preferences. We do not sell pre-packaged trips of any kind. However, to show you how some of our trips can fit together, and the kind of holidays that previous clients have taken, we have laid out here a few examples. These are for example purposes only and should not be taken restrictively. Your trip can include a combination of any parts of these itineraries - the only limitations are your budget and your timeframe! Experience the best of Bhutan in this week-long luxury itinerary, including iconic Dzongs in a stunning Himalayan setting. Located just outside of Bhutan’s capital, the Amankora Thimpu nestled within a blue pine forest, this 16 room luxurious resort is inspired by the country’s Dzongs with whitewashed buildings and high ceilings. The suites have views across the landscaped courtyard or into the pine forest and are all furnished with wood panels and the classic bukhari and terrazzo clad baths. Located outside the ex capital of Bhutan and renovated from an old farmhouse once belonging to the Queen Mother, the Amankora Punakha as with the other properties is a wonderful hotel to stay in whilst visiting the Dzong of Punakha. Accessed via a suspension bridge over the Mo River, the old farmhouse has rustic charm in the dining room and library, whilst the guestrooms are, as with the other properties, amazing. 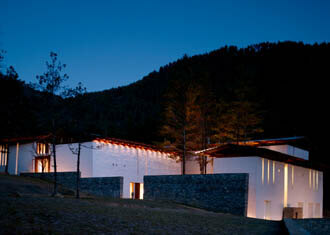 The first and the largest of the Aman properties in Bhutan and is still one of the best in this small Himalayan Kingdom. Located outside overlooking the town of Paro, the Amankora is nestled nicely within a pine clad forest with spectacular views across to Mount Jumolhari, this rustic resort but with a very contemporary design with a large flagstone courtyard.